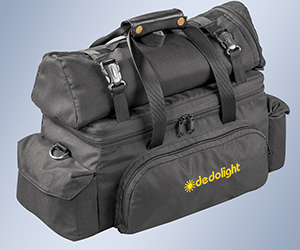 So, whether you are a News Cameraman, a VJ, a one man band, DV-warrior or even a dedicated documentary or drama cameraman, you can not afford to not have this absolutely divine DLED3 Micro-lighting kit in your armoury. Comprising three or four DLED3 heads, power supplies, (mains or battery) stands and soft boxes all in a small soft case that fits .. YES! In an aircraft overhead bin. The traveling cameraman's dream we have all been waiting for has arrived. Having spent my life on the road shooting big documentary series and possibly shot in every conceivable condition on the planet, I know how desperate you can get for just that little addition of high quality light to boost available light without carrying a huge case of lights and stands that cost a fortune in excess baggage. That amazing little kiss of magic light that lifts an interview without it being obviously lit, bounced or direct for in car shots or a splash of sculpted light as a back light or kicker or even in the back of a shot or pack shot that delivers a spark of beauty and magic to what could have been a drab, flat and un-interesting shot, especially with the bi-colour ability, or even assisting in the inevitable mixed lighting we always end up with. They also tuck into the tinniest spaces to work their magic too. I used the standard mini soft-box that is just big enough for a key; that also fits the standard DLH4 classic and the DLED7 series of lights with the diffuser on the front and with a grid as well to control spill efficiently. I achieved a stop of f2.8- f3.2 at ISO 800 at approximately 2 meters which is about the right distance for a talking head. I did not use the inner baffle/diffuser as this cuts too much light and we need all the light we can get out of these tiny but amazing lights. This was with a single light in a dark room so once you add another couple of lights as fill and back you end up with a decent exposure from such a tiny kit of lights. Lighting is not always about huge buckets of light all over the set, it is about control of subtle airbrushed flicks of light in the right place. This kit certainly delivers that and more. Be aware, that not using the inner baffle visually creates a star effect on the front of the diffusion material but this has little or no effect on the subject you are photographing unless it is a high gloss or mirror surface and you are extremely close. That does not sound like a talking head to me, so ignore it. Look at the subject not the soft-box please. For those who know me, and for those who don't, I am hyper critical about LED lighting colour , as there is so much rubbish on the market, but the whole Dedo family of LED lights output hits the nail and the Plankian curve right on the head. If the dimmer/controller says 32, it is 3200 degrees Kelvin or 56, is 5600 degrees Kelvin and green/magenta clean all the way up the scale and also through the dimming curve which is smooth and even. So with a combination of three or four DLED's, stands, soft boxes, grids and power supplies along with Vlock batteries and adapters if you so wish, along with a Dedo flexible stand extension of course and a cute baby DP1S Gobo projector that fits the DLED3, and a few gobos, all in one tiny Overhead Bin case, you have the perfect Up The Jungle travelling documentary kit that will last you a life time, if my DLH4 kit is anything to go buy, and you will truly love working with it if my experiences with this kit is also anything to go by. It has been pure pleasure over my career working with the lights that Dedo has created and these new perfectly formed bi-colour LED baby's are no exception. They are the iPhones of the LED lighting tools that are around today and are efficient, colour correct, great flood to spot ratio as you would expect with a clean flat field of light and tiny and light weight into the bargain. A dream come true.